So it seems, according to ESPN, due to lower attendance, and other factors, the Yankees are under pressure to sign Robinson Cano. 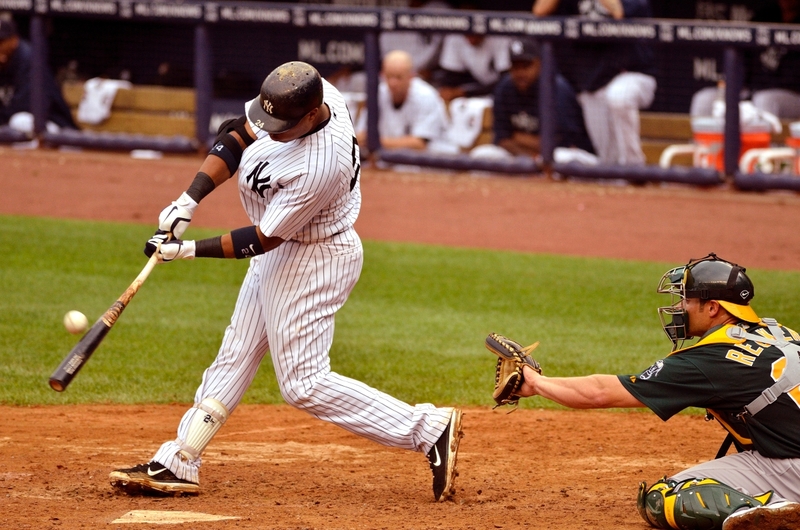 Robinson Cano is a phenomenal second baseman, with an arm and hitting skills anyone would covet. But is he worth 300 million over 10 years? No. You see, the real problem with Yankee attendance isn’t what’s happening on the field. It’s the silly pricing of the premium seats around and behind home plate. In contrast to 2007 and prior, these seats are as empty as they are full because they are overpriced and sold to corporate clients who couldn’t care less about baseball. This is why, in 2009, when the Yankees were winning the World Series, against Philadelphia, one could still see empty blue seats behind home plate as Andy Pettitte delivered the baseball. At Fenway, this is never the case. So, no, Robinson Cano is not worth 300 million over 10 years, and yes, the Yankee management should not be soaking the real fans and catering to corporate clients who show up at the 3rd inning, leave by the 7th, and don’t actually know or care what’s happening on the field. The creaky train wends its way through shadowy tunnels, downward toward the sprawling metropolis teeming with yellow cabs and harried pedestrians. Exiting the underground, walking several blocks and eventually passing through the checkpoint, the sun shines differently here than anywhere else. It is the light filtered by particulate matter suspended in the air like the hopeful destiny of so many souls turned into the incense and mist of our mournful distress. The earth around the pit is so permeated by the lingering toxins of ruptured machines that shoes must be washed before entering areas of respite or nourishment – not unlike the customs of old Nazareth and Bethlehem, albeit for different reason. Encircling the gaping cavity wherein the masters of commerce daily trod, now stand the charred and ghostly “edifice witnesses” keeping watch over the empty space once proudly occupied by their taller siblings. Day after day, men and women venture deep into the netherworld of incendiary debris, perchance to recover what remains of their fallen kin. Cleaving to them like an irrepressible aura is the odor of wet smoke, yet far more so they are adorned with the special perfume of heroism that makes their grimy countenance shine brighter than any cold statue of marble or bronze. They are the real Masked Marvels, the enduring disciples of true faith and love. And they are not alone. 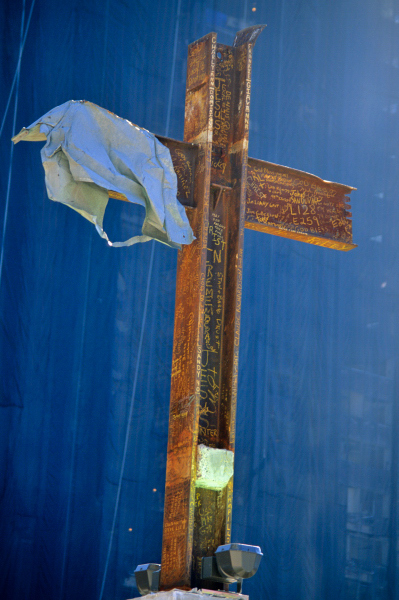 There in the midst of the sooty, carbon stained wound stands a Cross – girder of girder, steel of steel, True Presence of True Presence, begotten not made. Within this festering gash of sin, it is the preeminent Symbol of redemption; the sign giving testimony that out of evil, greater good shall come. In spite of this place, nay, because of this place, God is with us. Here, caked in the dust of congealed iniquity is the epicenter of saving grace, the true Ground Zero. In this final resting place of loved ones lost, the assurance of eternal life is found. This unlikely spot, so devoid of material beauty, shines as a beacon of heavenly Truth. It is like the Manger, unfit for a King, yet so fitting for a Savior. The soil of an urban Calvary cradling our frailty, yet cultivating our Salvation. Perhaps more than in any other way, to fully encounter the ash of mortality and grief is to finally comprehend the gift of Christmas. It is to behold and be held by a Divine promise, articulated in a tiny Child, that the life which is to come will be far greater than the life that has been taken away. Who can be blamed now? Bush got approval for Iraq and Afghanistan. Regime change in Iraq became US policy under President Clinton. And, a super biased opinion… I’m super glad Saddam Hussein is gone… The mass-murderer took the lives of 1.3 MILLION of his own people (including those living in Halabja, using poison gas). So, tonight the President asked Congress to delay a vote they didn’t ask to be put in the first place? Really? So this precipitous juncture is the doing of Congress? After drawing a “red line”, then denying he’d drawn a “red line”, then saying “the world” had drawn a “red line”, then it was “humanity” that drew the “red line”, then having lots of video with him drawing a “red line”, President Obama, assisted by John Kerry, got owned by Russian President Putin. The “red line” was crossed with impunity. The Russians have long supported Syria, and now their influence in the region is assured. Putin has played the horrendous use of chemical weapons masterfully. The vote to Congress will likely never be pushed. Assad’s place is now likely assured. And all this on the eve of 9.11.2013! Personally, I believe the documented use of chemical weapons needs a well reasoned and very serious response. While I don’t think “red lines” should be drawn unless one is totally sure of the actions that will soon follow when those lines are crossed (big mistake), I still hold the view that any decent and capable nation should not stand idly by in the face of gross atrocity, chemically based, or not. Europe is well heeled in the tradition of ignoring mass-murder. I’d like to think our country is different. Still, while I’ve supported every single major military action our Presidents have taken since 1991 (yes, I thought all along that ousting Saddam was a phenomenally moral thing, regardless of WMD), I am mystified by the lack of “peace” demonstrations, given our present President’s expressed intentions. Is it only Republicans who can be deemed “war-mongers”? Where are the councils and the groups and the ecumenical assemblies crying out against the use of force? The Pope has counseled against military engagement, but he’s one guy. Rightly or wrongly, Senator McCain stands with President Obama with regard to bombing Syria. He’s not a hypocrite. He’s a principled leader able to cross party lines (even when it will be deemed most unpopular). But where are all the marchers and placard carriers, so ready to appear on the scene with vim, vigor and vitriol when a Republican President feels the need to exercise military action? The comparative silence is deafening. You are currently browsing the BillKeane Perceptions blog archives for September, 2013.